The best thing about “All Tapped Out” is that it’s hilarious. It’s been only a month since Will Gardner was shot in our timeline—and perhaps about the same in the show’s timeline—but in what is both a blessing and a curse, life goes on. 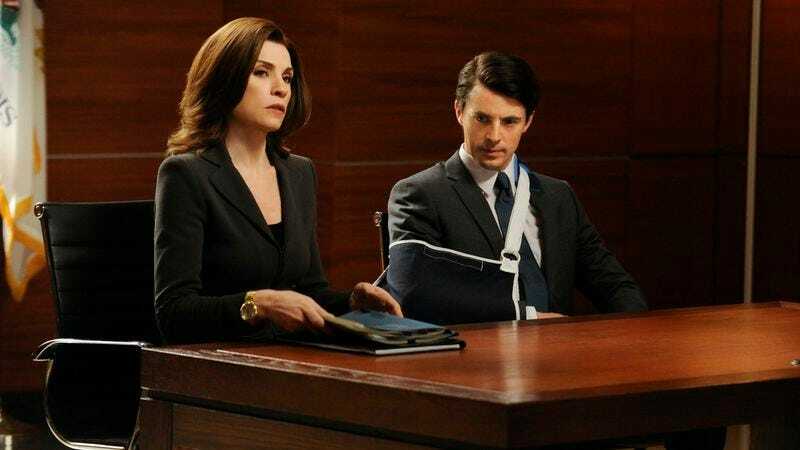 An episode like “All Tapped Out” demonstrates just how multifaceted The Good Wife is. The show is adept at its character drama. The grieving process for Will continues apace in this episode—I suppose if you can call Kalinda hurling a baseball at Louis Canning “grieving.” But the show excels, too, at bouncing its characters off of cases or scenarios that test their limits. Much of this episode is less about outright grieving and more about how these characters are coming to grips with life after Will, whether that means making deals with the devil or making peace with your husband (which could also be a deal with the devil, now that I think about it). But something “All Tapped Out” succeeds at that not all The Good Wife episodes do is that technology angle, which attempts to tell stories about the modern world in a real and accessible way. I have to suppress laughter every time I hear the word “Chumhum,” and though The Good Wife’s episode on Bitcoin was prescient, it wasn’t exactly compelling. Sometimes it seems like the show is exploring novelty merely for novelty’s sake, and in addition to being inconsistent, that type of thing has a limited shelf life. But “All Tapped Out,” which tackles the NSA wiretapping, balances all of The Good Wife’s strengths. There’s the technological angle, which gives the case its novelty—but there’s also the political angle, inherent in an episode about a controversial practice being done by a government agency. The Good Wife is at its best when it remembers that the heart of the show is about power in the modern world. “All Tapped Out” delivers. I’ve observed before that Robert and Michelle King are courageous—they often work to make their show flout expectations, resulting in subtle brilliance. But this might be the bravest thing I’ve seen on scripted TV. Correct me if I’m wrong, but did The Good Wife fire shots at a Department of Defense agency so powerful and secretive that for decades, no one would admit it existed? I think it did—and even better, it made unchecked, untraceable surveillance protected by the “State Secrets Act” look absolutely ridiculous. This right here is what we call freedom of speech. “All Tapped Out” is funny, as I said before—but it’s funny in a particularly dark way. It’s funny because there’s no legal and just way to squirm out of the NSA’s reach—Cary and Clarke, representing their “whistleblower” Jeff, exhaust themselves trying to even get the judge to review the “classified” evidence the NSA is holding. It means they have to resort to manipulation—changing the angle of the suit to a civil-rights attack, for example. It’s not the way the law was meant to be interpreted—but it’s literally all that our heroes have left to them. Manipulation. Or, in Peter’s case, outright bullying. I would never want to cross Peter on anything, because time and again he’s demonstrated a tendency for not just winning but also crushing his enemies in the process. At least when Cary, Clarke, and Alicia go after you, they do it to your face. Peter not only implicates a senator with the NSA on the phone—he also goes out of his way to destroy Charles Froines (played by Michael Kostroff), the agent behind the wiretapping. Froines is on “administrative leave” by the end of the episode, being interrogated for phone calls from suspicious individuals—people who are suspicious solely because they have Muslim names and wanted to buy a car, by the way! Winning is all that’s on the minds of most of our characters this week. Diane is battling Louis Canning for control of her own firm; Alicia and Louis are sparring over Chumhum; and NSA employee Jeff has left his job to go to Iceland, or something—where it’s colder, but safer from the reach of the NSA. A brutal invasion of privacy like broad-scale surveillance will do that to you. Michael J. 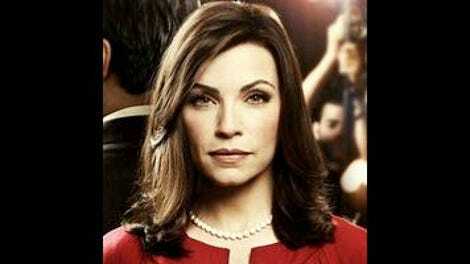 Fox, I’m sorry your show got cancelled, but I am not sorry you are back on The Good Wife. Alicia hanging up on Grace might be the best story Grace has ever gotten. Jeff is rocking an It’s Always Sunny In Philadelphia shirt during one of his polygraph tests, which is a cute shoutout to a rival network on the part of the show. There are a lot of wonderful Alicia moments in this episode, mostly due to Julianna Margulies’ work with the script. But a moment of direction, too: When Cary, Jeff, and Clarke get to the ground floor in the elevator, Alicia is waiting for them. The walls are painted blood-red. She’d just come from the state’s attorney’s office, where Castro was instructing some of his employees on a double homicide with photos. The color juxtaposition is jarring; the movement of the shot down to this red level is stunning. Fortunately for Alicia, she gets back on her game in this episode—her casual, ruthless dismantling of the prosecution’s case against Finn is a thing of beauty. It’s weird, though—even though this case is so dear to Alicia’s heart, she first recuses herself and then un-recuses later, because she’s decided she’s tough enough to take it. I’ll have to think more about that, but it feels like the same moral ambivalence I mentioned above: There is no justice, there is just power.